Weaving is one of the oldest crafts developed by man. Mostly it was used for plant materials, common in different parts of the globe. The tradition of using straw man of cultivated cereals for weaving was a continuation of the tradition of weaving of wild plants and the worship of a man dying and resurrecting deity of the vegetable world. Formed two main trends in the manufacture of wicker man made of straw goods. One had a ritual significance, and their origin led from the sphere of beliefs and worship of the person of the Supreme deities of nature, the second relates to the sphere of material human life. Rural residents involved in agriculture in different parts of the globe, used straw in life. It covered the roofs of the houses, it was spread domestic animals; of straw made mats and insulation mats, a variety of utensils for storing, carrying food and clothing; she made hats and shoes, and in some countries, elements of outerwear. The first cereal which began to cultivate people, is wheat. It spread from the steppe regions of the near and Middle East (Mesopotamia, Palestine, Syria) about 8 thousand years BC the Most ancient pictorial evidence of the cult of wheat are drawings of the Egyptians, which shows the cultivated wheat fields (photo 1).These drawings are dated 5-3-th Millennium BC, There is strong evidence of this in the earlier mythology of the Egyptians. Osiris and ISIS embodies the masculine and feminine as symbols of spiritual and earth (heaven and earth). The earthly parent cult that has developed around the deity ISIS, was one of the earliest cults in which the seed was given to the symbolic role of the deity. On the shards of Egyptian pottery from the graves, the researchers find prints products and tangles of straw. The reason for the creation of these products historians refer to the same belief in the divine power of the grain, stems, and some woven products of straw. These views were deeply rooted in the beliefs of the people of the past. They were largely based on fear of yield losses and threat to life. In most world cultures the belief in a spirit or God of the harvest, who lives in grain and whose house the person destroys after harvests, was very strong. Known in many countries, weaving in the form of cells, wreaths were designed to serve as a temporary shelter lost their home to the Spirit of the field. The same symbolic importance, and the last sheaf, which is kept until the next agricultural year, the beginning of which, during plowing the fields (photo 2) Spirit returned again in his element and was to be reborn in the new crop. In North Africa, Egypt, and currently you can still see the so-called the cage, woven of straw with the ears, they are known to other peoples of the world. These products are one of the oldest and originated from the weaving of the first farmers. According to pagan beliefs in the cage after harvest were staying with the Spirit of the corn, he dwelt there all winter, guarding the house and its occupants from evil and misfortunes. Cages hung outside the door of the house and barn. With the advent of Christianity this symbol in the countries of Central Europe became known as the "blessing house". 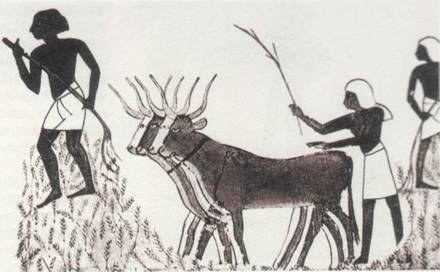 The first Greek chroniclers, visiting Egypt, described in detail the rituals associated with sowing and harvest. However, these records no mention of associated with these the rituals of weaving. There are several assumptions in this regard: either the netting was so insignificant that escaped from the view of the Greek chroniclers, or, more likely, this folk art has spread far beyond Egypt and the Mediterranean countries and was familiar to the Greeks. In early Greek mythology, the wheat was associated with the goddess of agriculture Demeter, whose name is in some versions translated as "mother earth", others as "giving wheat." In honor of her and her daughter Persephone (who is the divine symbol of the grain) of wheat weaving figures, resembling women. These images were supposed to convey to the people of ancient secrets, stored grain and associated with the cycles of birth and death. In Roman mythology, the goddess of fertility and motherhood was Ceres, whose name means "grain, bread, cereal". Many works of art (drawings, sculpture) confirm that in honor of her straw-made funeral products that were exhibited during autumn holidays of fertility. Favorite colors goddess Ceres were red poppies on the fields grow together with the wheat; it was thought that these flowers bring happiness. So straw tied with red ribbons or weave them in straw weaving, paying tribute to the goddess. Currently in Europe continue the tradition of making straw harvest decorations, tied with a red ribbon, which absorbed the traditions of many cultures, and maybe the red ribbon refers to the cult of the goddess Ceres. Traditions of Roman culture were transferred to new lands, mingled with the beliefs and rituals of the tribes inhabiting Central and Northern Europe. As a result, developed their own rituals and customs associated with planting and harvesting grain, sometimes having a very local manifestations limited to one or more villages. However, all actions were aimed at obtaining a good harvest, to maintain the spirit of grain during the winter and transfer it to the field in the new agricultural year. In today's world, where the success of farming provide good crops, their safety and existence of man in lesser extent, has become dependent on the effects of natural disasters and their impact on yields, the value of rituals and ceremonies was exhausted. However, oblivion showed that they gave people a lot more than just faith in a good harvest: the rites remained what is now called the spirit of the people, that manifested itself as his personality, provided and maintained a community and spiritual interaction between all its members. The beginning of the 1980s was marked in Europe as a time of rebirth and reinvention of the modern man values rites and rituals associated with farming and cultivation of grain. It was during these years, the world began to form Amateur Association of solomatnikov. Members of these organizations had a collection of the surviving products, engaged in the study and research of traditions, have revived the ancient technology of weaving and appliqué strips. For example, in England in the city of Valse revived the tradition of holding the festival "Straw bear" with a procession of clowns and musicians. The last mention of the holding of such processions relates to 1909. The festival is held 12 days after the Christmas celebration, this time in England starts plowing the fields. A similar holiday exists in Germany, in Frankfurt, before the carnival. Both festivals are associated with early sowing. Bear made of straw, embodies the ancient beliefs associated with the cult of ancestors, and crop protection. At the end of the festival the straw bear is burned, opening the way for the revival of a bear next year, which will be created from straw of the new crop. The course of the festival with a procession and a straw Scarecrow is reminiscent of the celebration of the Slavic peoples carnival. Revive customs associated with the harvest of the grain. For example, in the area of Devon in England in our time you can get acquainted with the revived custom of harvesting the last of the bread. Once the field is fully retracted and is the last unharvested plot of wheat that the reapers throw at him with their sickles to the field Spirit, who was driven to this last island, I did not know which of the reapers to attack the offenders. 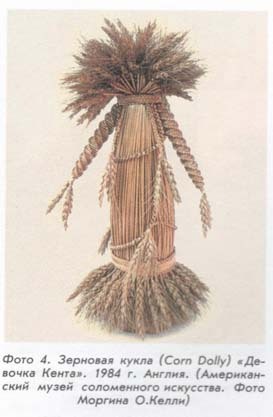 Then from the last stalks of wheat with spikelets weave a twisted braid at the neck (which is called "the neck"), obviously, traditionally, when the field was brought as a gift for their harvest of a sacrificial animal. It is believed that the spirit of the grain is populated in the "neck" where it is stored until the next harvest. The seat and the home of the spirit of the corn had served a variety of products, but obviously, the most common among all peoples is the last sheaf, the tradition of decorating which was in different people is very diverse, sometimes the sheaf was carried out in a certain mythological image, changing its name, already being called "grandfather", "grandmother" or otherwise. Everywhere a sheaf was done from the best of the crop and was the pride of the farmer. Special products were reaping decoration in England they are called "corn dollies" — corn dolls (the name has spread in many countries). $ (Doll) — change the word "idol" is in the understanding of the rural residents was the personification of the idol of grain. 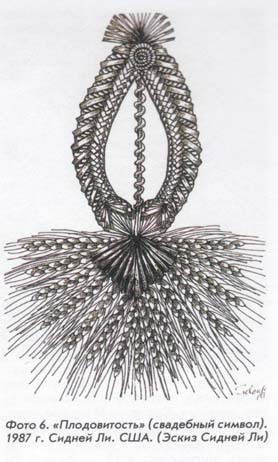 The shape of these jewelry may be the form associated with the name "doll". On the initial form and the symbolism of the "grain of the dolls" there are several opinions. (figure 3). The researchers came to the final opinion, a symbol of what they are. Some adhere to the idea that these products are reminiscent of the sheaf and symbolized the figure of a woman personifying simultaneously, the Mother-ancestor and grain Spirit. Others believe that the earliest harvest ornaments were made of coiled basketry. Spiral netting are found in many cultures around the world. They are the most ancient weaves and can symbolize the movement and development of spirit field. Despite the different views, forms of ritual performed products has been very steady and little change for millennia. In our fast paced world it is difficult to believe that the art form can be so static. Gradually braided ritual articles have lost their symbolic role, and she became less and less obvious. These products are seen as an integral part of the cultural heritage associated with the harvest and the beliefs of the agricultural peoples. In Europe, netting harvest jewelry has acquired a competition in which each owner tried to fulfill your decoration as good as possible in order that it was chosen as a symbol of the harvest of the village. Such events contributed to the development of new art forms and various kinds of nettings. Most forms of harvest decorations, currently known and specific to the traditional, emerged in the 16th-18th centuries. 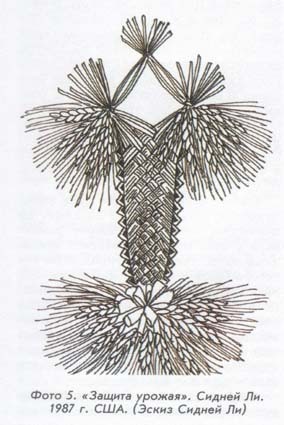 The more developed the decoration of these product retains the origins of the simple archaic forms that are close to the faith and the symbol of the house of the spirit of the grain (figure 4).Ornaments of straw was done not only to the harvest festivals, they were also used as a sign of attention and sympathy. The characters vpletennyh a variety of braided knots and hearts are widely distributed in Europe. For example, in the East of England kid, coming out to the girl who was supposed to have the wheat stalks. He could be alone with a girl provided that its hands are filled with weaving. At the wedding the groom gave his bride woven of straw "love knot", which symbolized the strong ties of marriage. 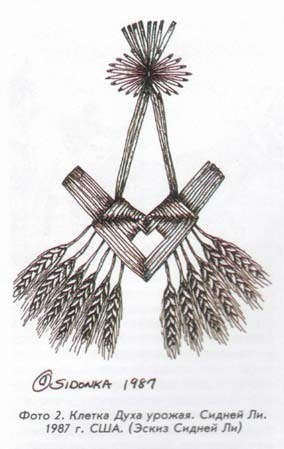 Design of "nodes" was sometimes very difficult, they were carried out such as to show the ability of the groom, his ability to work (Fig . 5). With the spread of Christianity traditional pagan jewelry has added new forms, one of which became the Christian cross. There are also less common forms, known only in one region. For example, straw spiders as stars are found only in Lithuania and Belarus. In East Asian countries, where the inhabitants are also engaged in the cultivation of various cereal crops, the attitude of the rice grain and straw was similar to the attitude of Europeans to wheat. Nowadays, the customs associated with the belief in the divine power of living grains and straw, are supported in China, Korea, Japan. They symbolize purity, glory, solar energy, knowledge, abundance, happiness and fertility. In mythology, the Fig was a gift of the gods or heroes were born at the same time with human life in the primary pumpkin. In China, rice grain was a symbol of protection from evil spirits. The cult of Mother Rice in Bali, a figure which was long (the male principle) and short (feminine) sheaves of rice straw, is an expression of the faith of the peoples of South-East Asia that the stalks of rice, like humans, contain life energy. In Japan, one of the contemporary forms of reverence and respect for the culture of the ancient beliefs and practices is the establishment of post-harvest holiday on the Shinto gods of rice, a giant composition of rice straw. The basis of the composition is a person who supports in his hands the Crescent moon dancing with sacred animals, each of which is symbolically associated with the God of rice, Inari. In many countries, the development and improvement of techniques of weaving, expanding the types of products made of straw, created the conditions, when this kind of folk art intensively developed in one of the directions of decorative and applied art, which was already not the village, and the city was formed there workshops. An example of this can be hat workshops in many countries of Europe. The products of these workshops — men's and women's hats, lace, braid was very popular in the 18th — early 20th century. Hat manufacturing has become a great incentive for the development of new weaving techniques and styles. There was the patenting of inventions.